MENU PLANNING INVOLVES MORE THAN A SHOPPING LIST. If you are the family meal planner don’t get discouraged if you can’t make the same menu plan your friends or family make because their grocery budget may be different. Not only that but their savings skills and ability to use coupons, price-matching, rewards points and so on all aid in savings. Also, keep in mind that not everyone has grocery stores on every other street corner. Some of you who live in rural areas may have a small grocer in town but must drive into a bigger city to see further grocery savings. 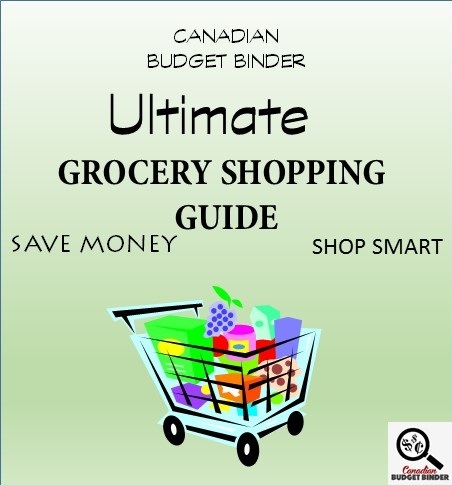 Canadian Budget Binder fan Mary has posted her grocery shop in The Grocery Game Challenge (GGC) for the past 5 years. Not only does she try different recipes she finds online to her menu plan but her monthly $190 grocery budget for 2 has remained unchanged for many years. You can follow her journey every week by reading the comment section of the Grocery Game Posts along with many other GGC players. Mary makes the family menu plan work along with her husband who is as smart of a grocery shopper as she is. Her excitement when he finds a deal is contagious. When they eat out they might see if there are any available coupons or deals as would Mrs. CBB and I. They also stock up their pantry, fill the spice rack and create homemade meals that keep them excited for meal time. I’m sure Mary has lots of other ways to save money and still eat delicious meals which attributes to her static grocery budget. They also buy foods that some might consider convenient such as sliced apples and that’s fine because she knows that it still works with-in her budget. Another wonderful CBB fan Beth loves to forage for food which saves her money and offers her options for menu planning. Head over to Aunt B on a Budget and you’ll find plenty of delicious meals she’s created with her years of experience in the kitchen. There are meal planning ideas all over the web so creating a menu plan for the week based on what you have on hand and what’s on sale is relatively easy to do. A well designed menu plan should challenge you to try different foods, create new meals and learn how to enjoy more for less. In the CBB house we choose to stick with easy meal plans because we’re always on the go and don’t have the time like we used to before our little guy came into the world. One of the key aspects of our weekly menu plan is keeping it healthy although we do splurge from time to time. A healthy meal plan consists of the foods that are right for your body and lifestyle. Mrs. CBB as you may now follows a high fat low carb diet similar to a Paleo diet or the Keto diet. Most of our meal planning ideas come from improving our recipes or creating new recipes from simple ingredients that we typically keep on hand in our stockpile. A pantry filled with spices, condiments and other food products that help build a meal is essential to every kitchen. For example: If you want to make a pot of chili it’s nice to have homemade jars of tomatoes, canned tomatoes, tomato paste and tomato juice on hand in the pantry. So we always keep a can or three. Spices are a must so our spice cabinet is always stocked up with the most common spices. Once you have your basic pantry staples in place and on a rotation according to weekly flyer specials and recipes you like to make then you’re all set to start a meal plan. From time to time you will obviously need to buy products to complete a recipe or recipe idea which makes grocery shopping far easier. Making your own spice mixes also helps to cut down on costs when grocery shopping. For example: We no longer buy packaged taco seasoning. Why bother when we have all the necessary spices in our cabinet to make it homemade taco seasoning and for far less. I will always support homemade meals over store-bought meals because you can’t get the quality of homemade in a box, bag or carton. For example: Frozen pizza may be on sale for $5.99 which we used to buy before we made homemade pizza. You don’t always have to enjoy a meat pizza that can drive the price up a bit and you can stock up on ham, bacon, pepperoni when it goes on sale. Furthermore there is a science to menu planning based on personal tastes, food knowledge and a desire to cook and prepare homemade meals. You don’t have to be rich to cook homemade food. Mrs. CBB has a friend who has debt and struggles to get by yet she always cooks and bakes. She brags about her homemade bread, soups, crock-pot recipes on Facebook and I would be proud too. Related: Homemade vs. Store-bought – Is it worth it? The point is the more ways you can find to lower the onset of grocery expenses the easier it is to meal plan, include luxury foods from time to time and eat well. No matter where you grocery shop there will always be store deals that aren’t advertised, reduced products and ways to earn free food with a reward system. These perks allow us to menu plan for less. Consequently engaging in ways that help lower your grocery budget also opens up your menu plan. The idea of a grocery budget is not to copy what other families do rather focus on ways to improve your own. Comparing what is in someone’s grocery cart is perhaps making assumptions based on products. I received a tweet from a fan whose husband doubted our grocery list and wanted to know what our weekly menu plan might look like. We’ve been asked before about our menu plan so today I’ll share with you what we will be eating this week for breakfast, lunch and dinner. To see our recipes please visit our Free Recipe Index. 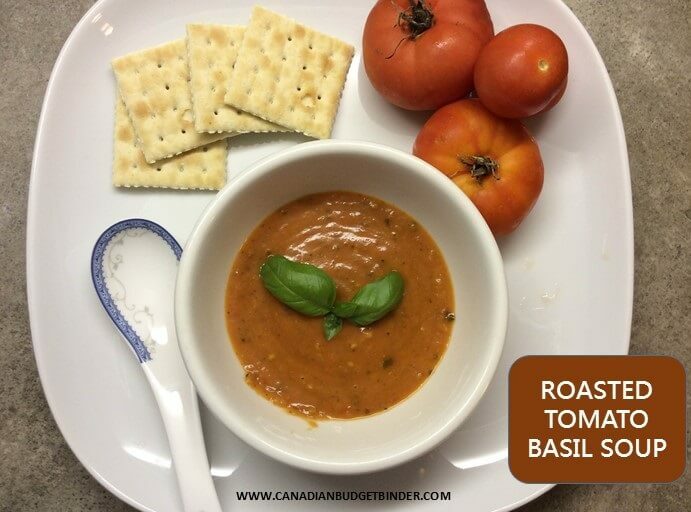 @CanadianBudgetB I was ready hubby your grocery game list & he was doubtful. He does the shopping. His question is what are meals this week? A grocery cart of food does not dictate what meals a family will eat during the week since they may be stocked up on certain products. For example: You might have been sick last week and all you survived on was chicken noodle soup and lots of water. The food that you had in your refrigerator and freezer didn’t get touched which means you won’t need much shopping unless it’s fresh produce the following week. Another thing to consider is that food prices differ all over Canada and the world for that matter. Different cultures enjoy cuisines that may include simple ingredients or more complex foods that range in price. Also if you follow a diet plan or lifestyle that doesn’t include meat, vegetables, dairy or processed foods you’ll also see fluctuations in a meal plan and grocery budget. I’ve always maintained that starting a garden from seed is the best way to eat healthy, can food and freeze organic fruits and vegetables to use throughout the year. Our garden typically would consist or tomatoes, green peppers, green onions and a variety of spices. These days we only grow spices and stock up on fresh veggies, cherries, plums and apples from my in-laws once or twice during the summer. This does help lower our grocery budget which is a blessing but without it we’d still be eating just as well because it’s all about knowing your prices, getting lucky with in-store deals and knowing how to cook. Just because you are grocery shopping on a tight budget doesn’t mean you can’t enjoy delicious meals like the shopper who has more money to spend. You may not get the best cuts of meats but it’s all about the way you prepare the food you eat. That means you might have to marinate your meat over-night to tenderize it or opt for the no-name or lesser known name brand products instead of name brand. Even then if you read carefully you’ll notice that some products come from the same home just different quality control specs. There are just so many variables that determine how much your grocery budget should be and what you can make with the food that you purchase. Does your meal plan include a new recipe every week? It’s nice if you can switch things up to keep meals interesting. Therefore to Susan, her husband and all the other readers of this blog below is our meal plan for this week based on food on hand and current purchases. When I work my long shifts at work I bring a lunch/dinner which is one meal for me and a fruit snack. I do drink coffee made free at work. When I work at my second job I don’t take a lunch or snack and just eat when I get home. I’m just going to type this in but we use our menu planning sheets which are free to download and keep it on our peg board in the kitchen so we know what we are cooking. This helps if we need to take food from the freezer to defrost the night before as well. Dinner- Slow Cooker Kirkland Ham, Mashed Cauliflower with garlic butter, homemade gravy, garden salad with extra-virgin olive oil and lemon juice vinaigrette. Snacks: We don’t eat snacks often but I like to have bananas and apples on hand, yogurt, popcorn, almonds, walnuts, hard-boiled eggs, cheese, homemade treats from time to time. Even our grocery budget needs a workout and as a result helps keep our budget trim and fit. Most of all no matter what your food budget is ask yourself if what you are buying is worth it. Quality, Quantity and Price go a long way in the food industry. What advice would you offer to someone who is struggling to create a menu plan based on their grocery budget allowance? Congrats to Ballot #4 Christine for winning the February Grocery Game Challenge! Post your shop and you can be next. It always seems at the beginning of the month we do a stock up of foods we’ve run out of stock. Luckily there were some deals this week on spices, oatmeal and cereal. The meal plan above doesn’t include our son because he’s not really eating at all right now. A bite here and there or a part of a banana, cucumbers and apples. We’re working on transitioning him away from milk but the kid loves the stuff. We made a pit-stop at Costco to get gas so we ran in to pick up a few bits espeically the almonds which we love to roast and snack on. It’s far cheaper to do it this way. I bought a small bag of white flour as no one uses it but me in the house and I don’t bake like I used to. The tortillas were on sale for $1.99 instead of $3.79 so I picked up a pack for some wraps. Typically I would make a batch homemade which would last me a few days but until I cut some of my hours I won’t be doing much of that. You can’t beat fresh though. March is a 5 week month for grocery shopping so we’re going to fit in a no-shop week. Total Out Of Pocket: $273.00 (Dear Lord! That’s almost your Monthly budget Mr CBB)! NN Waffles – $4.00 <– total impulse buy. NOT on the list but on sale! Scotts Ice Cream – 2 @ $4.49 – 8.98<– received a call while in the grocery store from my son, his request. PC Points Plus Earned to date: 28.950 ***26,800 THIS SHOP! 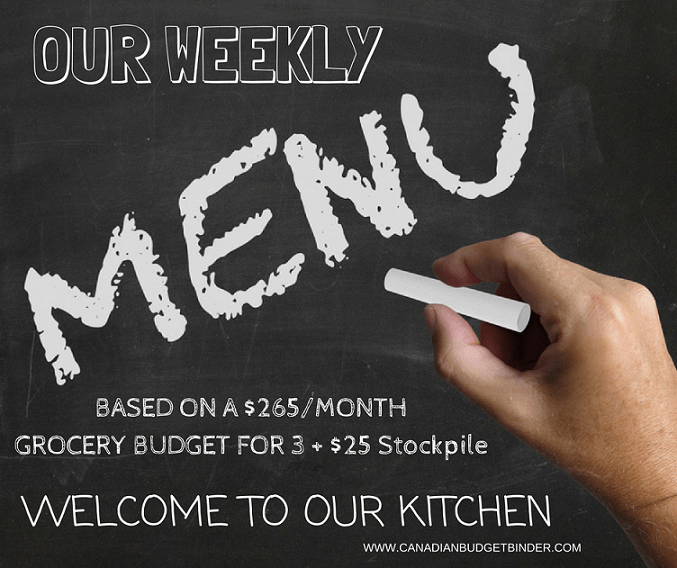 Weekly Overview (your final thoughts): Did some meal planning this week, pulled out the slow cooker, ended up buying items I wouldn't normally buy. Did bigger shops with less trips this week. I noticed you purchase No Name quite a bit. Could you tell me your thoughts on No Name products? Different tastes? Are they really cheaper? Do you stock up on name brand if you find them on sale or do you stick to No Name? The slow cooker is our friend too!!!! I always check the sushi to see if it has a 50% off tag as we both love it but the wife no longer eats it. I would though. Great deal. Ricotta cheese is pricey. The only time we use it in a recipe is if we find it 50% off. This is one of those ingredients that might pop up at Zehrs and we do the happy dance. Do you like to travel to the different shops to see what deals you can find? We do even though it might take a bit more time and gas money. However most of our shops are on the same road or close to so it’s not that bad. Now that you’ve posted a few times in the GGC have you reviewed your shopping habits or do you think it’s too early? Keep at it, this will pay off in a big way for you. You get ballot #7 Mr.CBB 🙂 Have a great week Mary Ann. I think that’s the first time I’ve bought Ricotta. Not sure I’ll buy it again full price but the lasagna was delicious!! Ive been keeping a copy of my posts so I can review them once I get a few solid months in. I also have been breaking out the non-grocery expenses to help fine tune it. I use Flipp all the time, but thought you had to have the actual flyer with you get the store to price match…no? I’ve been wondering, do you keep your reserves in a separate account to help you keep track, or do you just keep a record of the amount? We made it through to the end of February with only one shop. The fridge was all but empty and we were out of a few pantry staples, but, astonishingly, the freezer is full of prepared meals, frozen veg, homemade bread, and meat. If we had to, I think we could easily make it through March with what we have on hand. It is astonishing what a difference meal planning is making to our grocery budget. I’ve added a savings year over year line to remind myself of the difference the relatively little bit of work we are putting in is making. I did find in planning our menu for a month it’s easier when I assigned certain meals to certain days. Saturday is Meat & Potatoes day; Monday is Soup day, etc. Making bread is a great savings as well. $0.62 per loaf versus a couple of dollars for store bought. I make five loaves at a time and my husband has half a loaf a day for his breakfast and lunch. I figure we’re going to save about $250 for the year on bread alone. We don’t feel as though we’re sacrificing. We’re just eating far more efficiently. We have zero waste and we’re saving on time and electricity by making double the food we are going to use then freezing half as a prepared meal for later. My March goal is to limit ourselves to one more shop for perishables only. I’m impressed with your grocery budget for 2 including stockpile. I’ll be watching your shops carefully as we are buying for 2 as well which can be challenging. Our son hardly eats a thing so he’s also included in the grocery budget but doesn’t account for much other than milk and a few other bits here and there. Meal planning certainly helps the grocery budget and lessens any stress or tension about dinner when nothing is planned. I know that can be overwhelming for just about anyone which is why it’s easier to say, “let’s eat out” or “Order in”. Yes, please go ahead and add any lines you’d wish to the GGC as long as you are willing to track that number for the year. Would you buy bread that is 50% off? We can get it for under $2 a loaf sometimes under a $1 a loaf from Zehrs. I love making homemade bread and eating it too. I agree you can make it for less depending on ingredient costs and utility costs. A savings of $250 on bread alone for the year is HUGE savings! We don’t eat much bread at all these days but see folks the savings to be had making homemade foods vs. eating our or buying pre-made. I love the idea of making double the food and freezing it. I also like the zero waste program you are on. What are some ways you fight waste in the kitchen? I agree that Bicks has a great quality product and it’s impossible to compare No Name pickles to Bicks Pickles. If I saw bread for under $1, I would definitely buy a few loaves for the freezer as a backup in case I couldn’t bake homemade. I find, however, that my concern is increasing over the preservatives added to things like commercially prepared bread so I prefer to make homemade. The biggest assists to our zero waste program have been meal planning, back to basics meals, using what we buy and the freezer. My uncle used to tease my aunt, “Make sure you put that in the fridge until you get a chance to throw it out.” He could have said the same to me. Often the leftovers I intended to use sat until they were unfit for human consumption. I’d even buy food and not get around to using it before it went bad. Now, if there is a little bit of anything left over it goes in the freezer to be used later in a soup or casserole. I even freeze chicken bones if I don’t have time to make stock. If I buy anything that won’t be used up quickly it’s prepped and goes directly in the freezer. These changes have also led to a savings on garbage bag tags ($2.50 per bag in our community) and reduced the amount of food packaging in our recycling bin. I’m embarrassed to admit we used to use a bag tag a week. Since adopting meal planning and mindful grocery shopping strategies inspired by everyone’s GGC posts, we’ve used one bag tag so far for 2017. Your ground beef pack was 2lbs or 2kg? Cause it seems pricy for 2lbs……I havent looked lately at their everyday price since I only buy it on sale for $6.59kg or less. I have noticed lots of people buy almonds from there. It is a great price!! It’s KG good catch thanks I’ll update that thanks. Yes the almonds are cheapest at Costco. For Mrs. CBB if she wants to roast them or grind them up for almond meal it’s her best option. We all love almonds even the little guy but right now as you know he hardly eats anything at all. His nurse and doc aren’t worried because they said kids his age go through stages. Ok. Considering you called me out I have to comment. The funny thing is I saw the email with the article title and first thing I thought was that I would read it on the way home with hubby (we commute together). So just a couple of observations. I don’t see any meals for your child. Also there are a couple of days with no breakfast but I figure that was overlooked due to typing it out. Hubby said you guys sure like bacon (especially after your score last week). I also told him about Mrs. CBB’s food plan. There is one day where you have a Caesar salad as your dinnner. Now I think that is due to work hours and your lunch was really your dinner but hubby didn’t feel like that would be a satisfying meal on its own. Not sure how big you are but my husband is 6’6″ so he eats quite a bit. Next, we have 2 sons living here. One is 20 and the other is 16. They are also tall so feeding those growing machines is a constant challenge. We go through at least a bag of milk per day. So even if we were to double your budget for 4 adults I think they would be starving. That said, I could probably get by on this and maybe even come out slimmer for doing that. But there are choices we make that cause us to spend more. For example the frozen pizza vs homemade. In our house that homemade pizza would cost a fortune due to all the stuff (meat) they would load on. So we get the dominos WagJag deal when it comes around ($7 any size unlimited toppings). and for snacks we try to have fruit and veggies rather than chips. So is our budget able to be pared down to yours? No. But is there room for improvement? Definitely. And having articles like yours allows us to have a conversation with a starting point. Thanks for stopping by. I didn’t call you out in an evil way hehe… it was more a reminder that we’ve been asked a few times what our meal plan was and I’ve been meaning to do a post on it. When I get up at 4am the last thing I want to do is eat so I just grab coffee. On occasion if I want I might grab a banana and yogurt but it’s never a planned meal so I don’t document it as such. Mrs. CBB doesn’t eat breakfast on the weekends either just coffee and then lunch at around 11 and dinner when I get home or before because sometimes we have emergencies come in at the last minute and I’m needed. The moral of the story is we can’t compare what one family eats to another nor can we compare food budgets because it’s just not possible. ^^^ This is exactly what a post like this is supposed to do, you’ve got it!!! That makes me very happy. 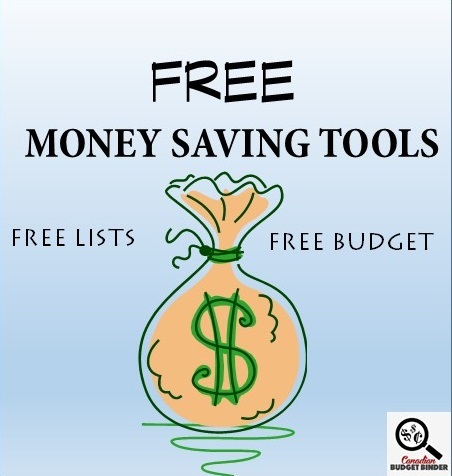 There are weeks where we spend more money and go over our monthly budget because we buy more, overspend or just don’t find the deals like we do other months. Food shopping really is a game of savings but without extra effort apart from using the flyers it will cost more. We’d love to have you post your shops with us for the rest of the year!! Get the Mr. involved too!! 🙂 I’m sure as our son grows so will our grocery budget because like you mention growing boys eat lots. That used to be me and I still can but I monitor how much I eat as I get older. It’s ok. I didn’t mean called out in a bad way. It just closed the loop. And I find that the only way these things work is a gradual change. Like budgeting or dieting if you try to make an extreme change overbite won’t work. But if you do it little by little it doesn’t seem that painful. Right now I am trying to focus on reducing wasted food. Leftovers are not a hit here. So portion planning and using what we have is something we are working on. I will definitely read the other post you mentioned. PS. Wish we had a Zehrs nearby. They seem to have great prices. You are very right Susan. It takes time. We have a friend who tosses all of the leftovers because no one will eat them. YES Zehrs has great 50% off prices as does Food Basics on produce. Walmart also has $1 bags stuffed with fruit and veg on their reduced racks. You can also find tonnes of bread at both stores for cheap even better if there is a coupon. Over time you learn more and more about where to look, what to look for and the savings start rolling in. As you mention portion control is a big deal in your house right now. Does anyone eat the leftovers? What would you do with them? How do you go about the portion control? Scanning Code of Practice (SCOP)to date – on the list!! Over budget on my first month 🙁 but I did set my budget a bit lower than what’s actually been happening, so that’s a plus. This was my big shopping period. I noticed that I went to many stores and several times picked up “food on the go”. I haven’t been successful figuring out how to incorporate coupons, points are relatively easy. I tend to save my points. Thanks for letting us know you get paid twice a month so your shops will follow suit. That helps all of us follow along on your grocery game challenge journey with you. I enjoyed reading your overview because it was nice to read how the grocery game posts have been able to let you see a glimpse into your actual shopping habits. Are you able to price match where you are instead of going to many stores? Like you I like to visit certain shops only because I know there will be deals that I might miss out on. This makes grocery shopping a challenge for us since we tend to buy more which means we buy less of something else. Do you collect coupons by mail, at the store, flyers or by using coupon apps? Maybe we can all help you get a bit more savings from coupons. We save our points as well like a little savings account or emergency savings. It’s always nice to watch the number grow. Where you add “snack food” is that the food on the go you are talking about? If so, do you do any meal prep or snack prep ahead of time? Can you make the time to do this? If yes you can drastically cut down on eating out. Also, bring snacks with you when grocery shopping if you tend to over-shop. Everyone who is human struggles with buying more than intended because food is part of survival. What will be your actual grocery budget moving forward? How many people will that feed? Do you have certain lifestyle diets you are purchasing products for? Lots of questions but all worthy of investigation. Glad to have you back Mary Ann…. anything you need just let us all know. Thanks for the tip and reminder Mary! Yes, I will do that! Re Price Match – haven’t been organised enough for that yet (been talking about it! )…and to complicate things our flyers stopped being delivered. I called and am waiting for them to start again and plan to utilise price match to avoid the running around. Re: Grocery budget…at this point I plan for $800 per month for 4 people, or $9,600 per year. I tend to include all grocery store purchases in that figure however, so am pairing it down and dividing it between the various categories to get a better handle on things. I would like to get our grocery budget to $600 per month. Re: lifestyle/diet – my husband has gone gluten-free. Which has changed many of our purchases. Still trying to figure that one out. It took me 1.5 hours to post that shop 🙁 any tips on doing it in less time. Do you use a smartphone at all? There is an app you can load called Flipp which shares all of the flyers wherever you live. You can use your phone to price match as well. That’s great to hear he is bringing home the receipts. Yes one step at a time is great but keep a timeline in mind so you don’t get stuck in the steps for too long. My meal plan is for supper only, which usually means that includes my lunch the next day. I don’t break it down to specific meal on a specific day of the week. I like my life very planned but that’s too planned for me….besides I never know what I want to eat until that day. My meal plan is more like a restaurant menu but without the meal costs added and in a pretty laminated packaging. That’s true and why I called it just a “plan” as so many things could happen to change that plan. Overview: I’ve redeemed my first PC Points for this calendar year so now my budget value has shrunk by $30.00. I was informed my daughter today that we have 17 cans of tuna so we are well stocked for tuna. I agree but tuna is a cheap meat and is so versatile to use. Next week should be interesting to see what will be purchased and made with the ingredients we have on hand, in addition of not going over the left over $22 budget. I’m hanging on to my points for Christmas this year. I said that last year too and then never actually used them. I’d rather have points available, if I need them though, than wish I had some extra funds to use on splurges and treats. 🙂 We used to travel at Christmas but with our parents getting older (MIL is 96 in a few weeks and my Dad will be 87 on New Years Eve), we don’t want to miss sharing our holiday season with them. My plan was to hold onto my PC Points but things happen and I’m glad they are there. Yes, some of the items were splurges but most were needed for the meal plan that was chosen that week or part of the staples of the house. The most I’m willing to spend on tuna regular price but will only pick up 1 or 2 cans (at most) and only if I need it for my meal plan that week. Typically I pick up tuna when it’s under a $1.00 and then it’s a number of cans so there’s a stockpile ready for use. I wish I could travel at Christmas but alias, the funds aren’t there at the moment. The shopping every other week worked out well for us this month but wow…talk about close with only $0.86 leftover that I am now adding to the re-stocking reserve. Good thing I had planned for this to be a NO SHOP WEEK! The DINNERS I have planned for this week include new recipes, leftovers and even an evening out! OUR NEXT USA SHOP POSTPONED TO MARCH 19th! OUR CURRENT TOTAL UNUSED RESERVES ARE $1,293.14. This means the $1,274.44 that we carried forward from 2016 PLUS AN ADDITIONAL $193.29 that we have added in 2017, LESS $174.59 that we have drawn out for use in 2017.